Thousands more get a terminal illness, become disabled and or are injured each day. April 28th each year is recognized as the Day of Mourning which began here in Canada. It is a day when unions, governments and businesses publicly acknowledge workplace injuries, illnesses, and deaths. Many flags fly at half-mast to recognize the lives needlessly lost and the tremendous suffering of those left in the wake of workplace tragedy. April 28 is also a day when together we renew our commitment to improving workplace health and safety rules and legislation to bring an end to such needless suffering. This May 9th will mark 25 years since the Westray Mine disaster in Plymouth NS. The Nova Scotia Federation of Labour, our affiliated unions and the Canadian Labour Congress are working together to ensure we never have another workplace disaster like Westray in which 26 men lost their lives in a needless tragedy. This year on April the 28th we are asking the federal government to do more to enforce laws holding employers criminally accountable for workplace death and injury. The call will be the focus of cross-Canada events marking this Friday’s the National Day of Mourning. 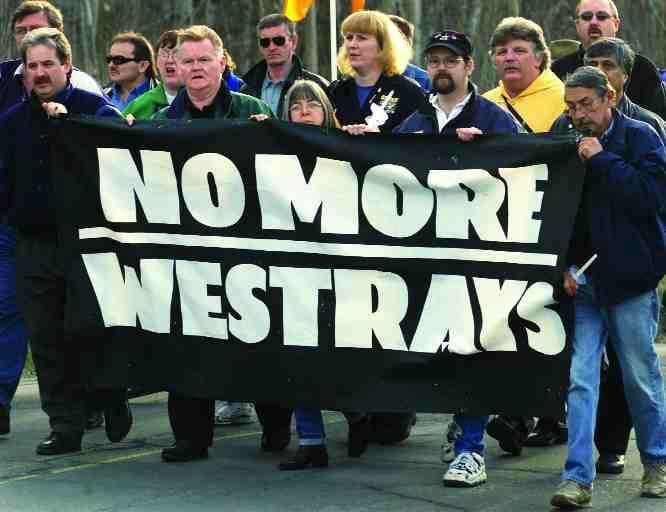 After Westray, many, including the miners’ families, unions and health and safety activists mostly led by a campaign by the United Steelworkers, won new Criminal Code provisions in 2004 making it possible to prosecute employers for negligence leading to workplace death and injury. In the past 13 years, only four employers have been prosecuted under the Westray Law. Too many workplace fatalities are never properly investigated and only a handful have resulted in criminal charges and that needs to change. In Canada, roughly 1,000 workers die every year because something happened to them at work, and thousands more are seriously injured. While not every workplace fatality is caused by employer negligence, health and safety advocates say every fatality must be treated as a potential crime and we agree. This year, we have been working with the Westray Families Group, the provincial government, the Workers’ Compensation Board and United Steelworkers’ Union and others. Allen Martin is from the Westray families group. His brother, Glenn David Martin, was one of the 26 coal miners who lost their lives in the Westray Mine explosion and Allen says the federal government has an opportunity to ensure that his brother and the 25 other miners lost that day did not die in vain. “The Westray families don’t want to see anyone else suffering the way we have. We need the federal government to honour the memory of the men we lost by acting now to finally, and decisively, ensure enforcement of the law that is their legacy,” said Martin in a recent press conference in Ottawa. Nova Scotia has a long history of mining disasters and for many of us having a family member killed at work is real. My grandfather was killed in Stellarton Mine in 1935, so I never knew the man, but it means something. My Mother would talk about him but because he died at work and their family suffered as so did we because we never met him. In Nova Scotia we saw 20 deaths in a workplace in 2016. It’s a serious issue and it could be someone we may have worked with or someone we may have known who was killed at work. I have always had a personal interest in safety because of those tragedies in my own family. I felt betrayed and I know the pain and suffering a family goes through when they lose a loved one. I believe no worker should go to work to be killed, become injured or become sick from the workplace. Chances are, if an accident or a close call has not happened to you directly, then you know someone for whom it has. An accident at work can happen to any one of us and the effects can be devastating. The price to pay in suffering, change of work and lifestyle is enormous. Please join us and reflect on the fact that this is a huge issue and the laws must be enforced. In Nova Scotia, we do have a special prosecutor but fines and jail time need to be set higher and enforced. If the courts were to levy maximum fines and jail time that would go a long way to change things. The true change will only happen if we work with all our partners at WCB, governments at all levels and employers to change the culture of thinking. I am confident that any employer who has had to tell the family of one if its employees that their family member was killed on the job, today, they would agree. Don’t ever think it can’t happen, it happens every day to someone’s family.